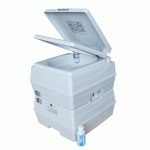 The TOTO Ultramax is a toilet that many people feel is a worthy investment into their home’s bathroom. It is a toilet that has a classic design and it is often seen with an elongated bowl, which many people prefer if they have the space for it. Now, the Ultramax has another style option. Is it better or worse? Read our TOTO Ultramax II review to find out. One of the best things about this toilet is the Double Cyclone flush that it provides. This means that you get a more thorough flush, every time that you flush. Especially since the entire bowl is coated with SanaGloss to ensure that nothing can stick to the sides of your toilet bowl. SanaGloss puts and ion barrier of glaze to make the bowl super smooth and that every flush is a cleansing flush. The bowl style is elongated to ensure comfort to anyone who sits on it. You also do not have to worry as much about someone in your family missing the bowl, especially families that have smaller children. 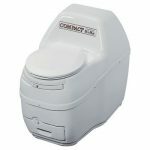 This toilet is also more comfortable to many because it has a higher seat than standard toilets, but it still falls into the universal height for maximum comfort. The seat height is 17 1/4”. The tank’s height is 28 3/8”. 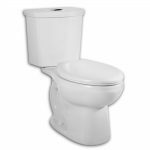 The good news is, even with the large size and elongated bowl, you only need 1.28 gallons of water per flush making it a great option if you are looking for an eco-friendly toilet. If you have a particular style or color in your bathroom, the Ultramax II gives you a lot of options in color. 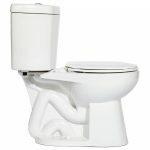 You can choose from a bone, chrome, colonial white, cotton white, or Sedona beige toilet. Does this make it easier for you to create a bathroom around your toilet? Other features included are a chrome plated trip level and a SoftClose seat. 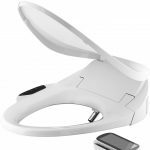 This means that it looks stylish in every way and you do not have to worry about the toilet slamming closed during the middle of the night. There are also no holes in the rim of the toilet to make it easier to clean. 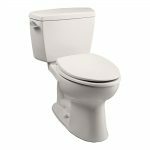 TOTO is a name that most people trust when it comes to toilets and the Ultramax is one of the ﻿﻿best TO​TO Toilets ﻿for the money. The larger size and having the seat higher up makes it easier for some people to use. One example would be anyone who has trouble getting up from a squatting position. However, for some people, they feel that the bowl is too high for their comfort. It does not hold or require a lot of water to flush properly. This also appeals to many people. The thing is, some people feel that as an elongated bowl, it should fill up more than it does. 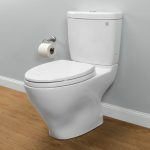 This could be a personal preference issue for some, but in general, it will be ideal for the right people, especially since it does flush and clean all at the same time. 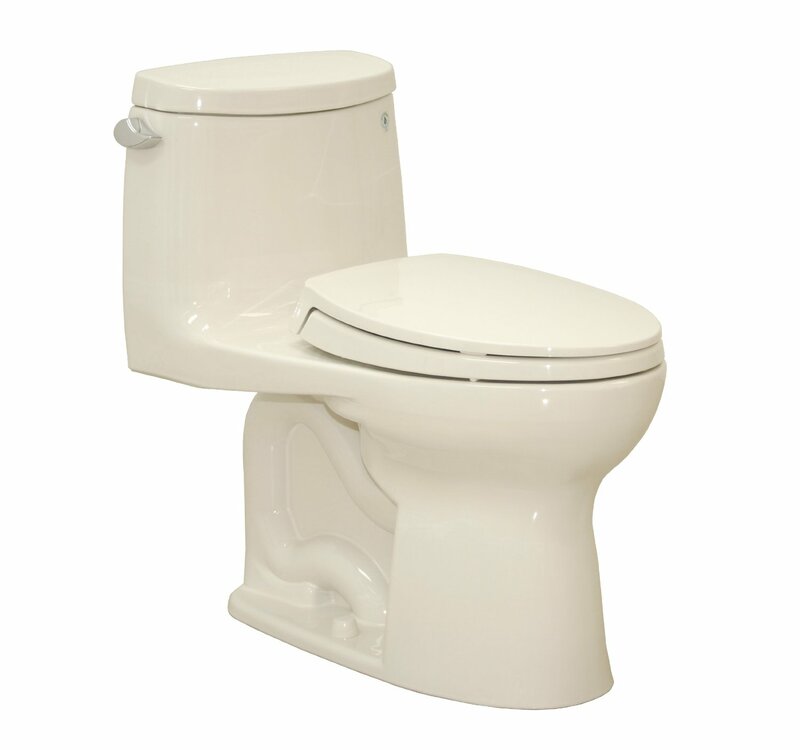 Most people feel that it flushes quickly and that the tank fills up quickly after they have flushed. 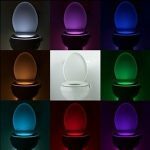 They feel that it is very modern in style and fits their personal style better than other toilets. They like that it is affordable and only slightly more expensive than the original Ultramax. In general, this toilet is designed to be the only toilet that you will ever need. However, as with other TOTO toilets, the way that it is glazed, does require you to take care when cleaning it. If you use a harsh chemical, use an abrasive chemical, or a firm toilet brush to clean it, you do risk causing damage to the SanaGloss coating. Therefore, many people recommend using just a little dish soap to clean it. 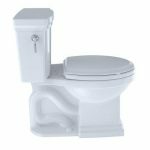 If you still want to use something designed to eliminate odors and sanitize bathroom’s, you can, but you may want to avoid the blue colored chemicals since they may be the one thing that can stain this toilet. To get a good cleaning, in between cleanings, you may also want to consider holding down the handle to ensure the dual water cyclone can clean all of it. 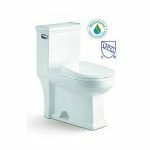 Some people have stated in their toilet reviews that parts get broken in shipping and there is sometimes an issue with the flush valve getting damaged. These issues are easy to deal with and most admit that customer service helped them as much as possible during the warranty period. With that, you definitely have nothing to lose by giving this toilet a chance, if you want to sit a little higher on your “throne”. Ready to Make the TOTO UltraMax II Yours?